I am glad they sent a pouch/bag instead of a big cardboard box. These bags are useful for storing things and come in handy for travel. 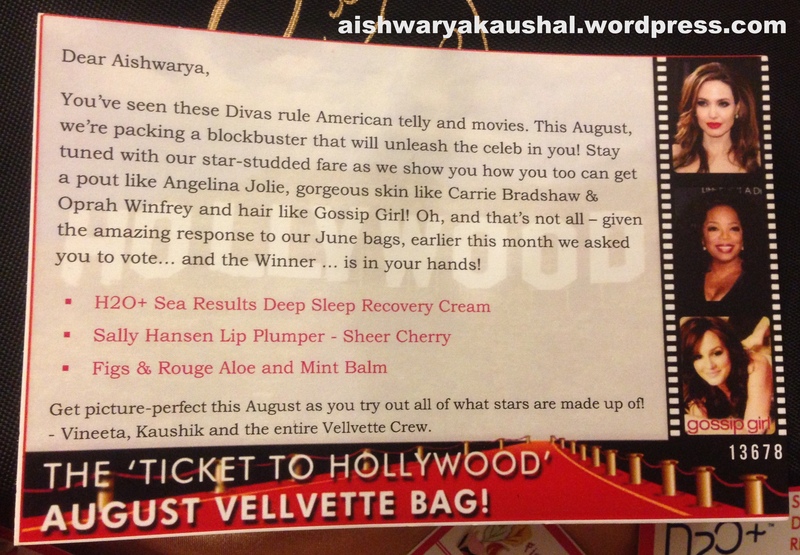 I have been seeing “Bonus” products in many other blogger’s posts about this month’s Vellvette Box but I got only 3 products! However, the good part is that there are 2 full size products. 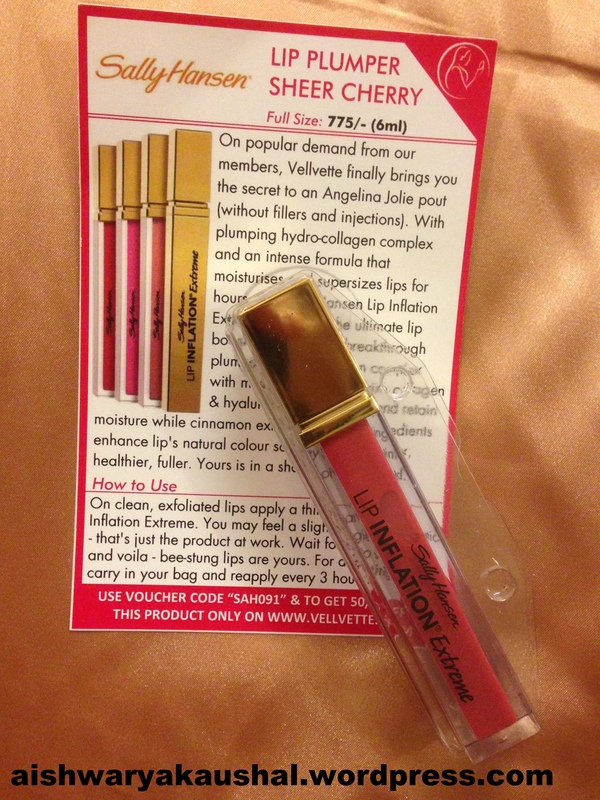 The first product is the Sally Hansen Lip Inflation Extreme Gloss in “Sheer Cherry”. I have been meaning to try this product and I was excited about this in my bag. I am glad it is full size. Many other bloggers got a clear version but I was glad to receive a beautiful color. And NO, it does not plump up my lips. It doesn’t even feel tingly enough to be a lip plumper. I would just call it a regular gloss. It smells like Cinnamon which is a little off putting because I don’t like the smell of Cinnamon. I do like the brush applicator though. I prefer brush applicators over doe foot applicators. The next product is another full size product. 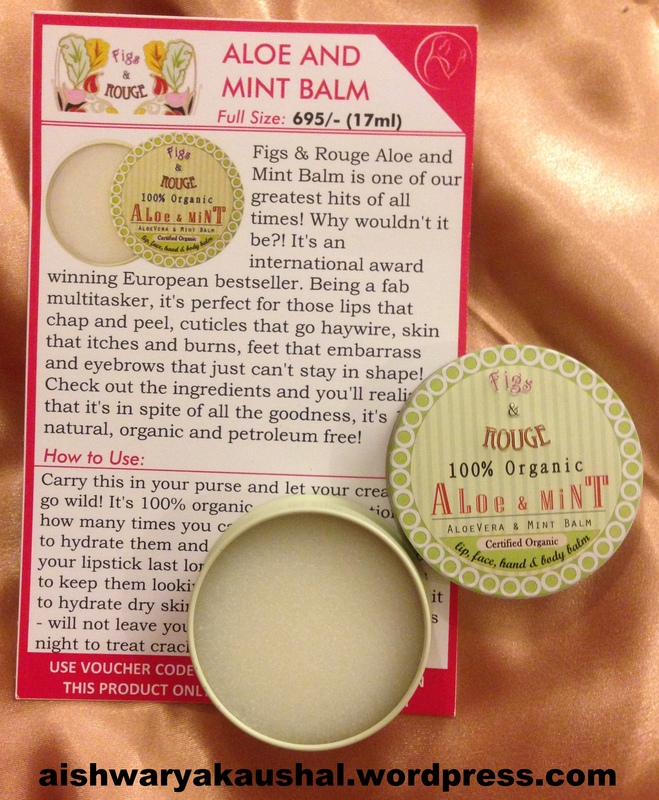 Figs & Rouge 100% Organic Aloe & Mint Balm. This is a repeat product. I saw it in the February issue. I do like appreciate a full size balm. I am a lip balm hoarder and addict! I do not like the smell of this. I can faintly smell mint and perhaps some Aloe. But, when I put it on my lips, I did feel the cooling sensation of mint and I could sense a whiff of mintyness. I like that it is 100% Organic. The last product is a disappointment! 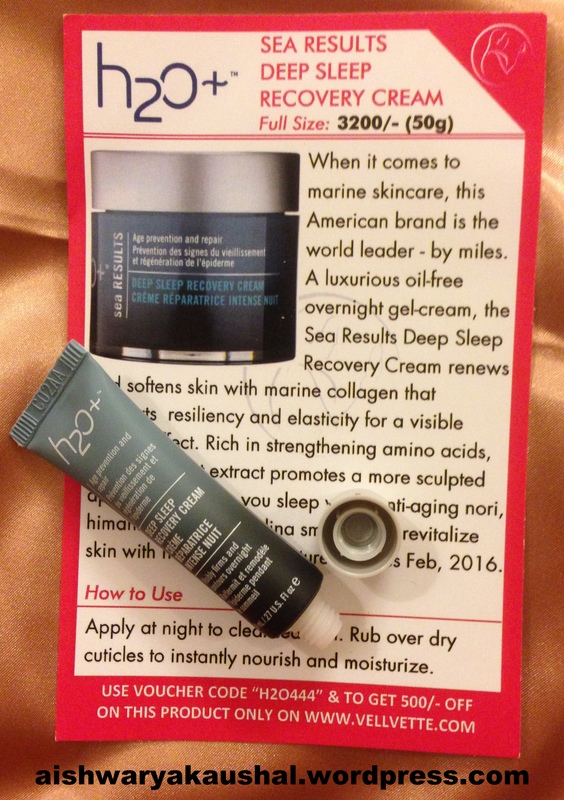 😦 H2O Sea Results Deep Sleep Recovery Cream. I have seen some other bloggers getting a much better sample of this product range. Maybe even a deluxe sized sample would’ve been alright. I wish Vellvette paid more attention to the customer’s needs. I do not really need anti-aging right now! Plus any skincare takes atleast 3 weeks to start showing results. So, I don’t care about itty-bitty samples of skin care. However, this claims “Overnight Treatment” so I guess this would last 2-3 uses. I will give it to my mother to try out! I will not say I am unhappy but I am not ecstatic either. 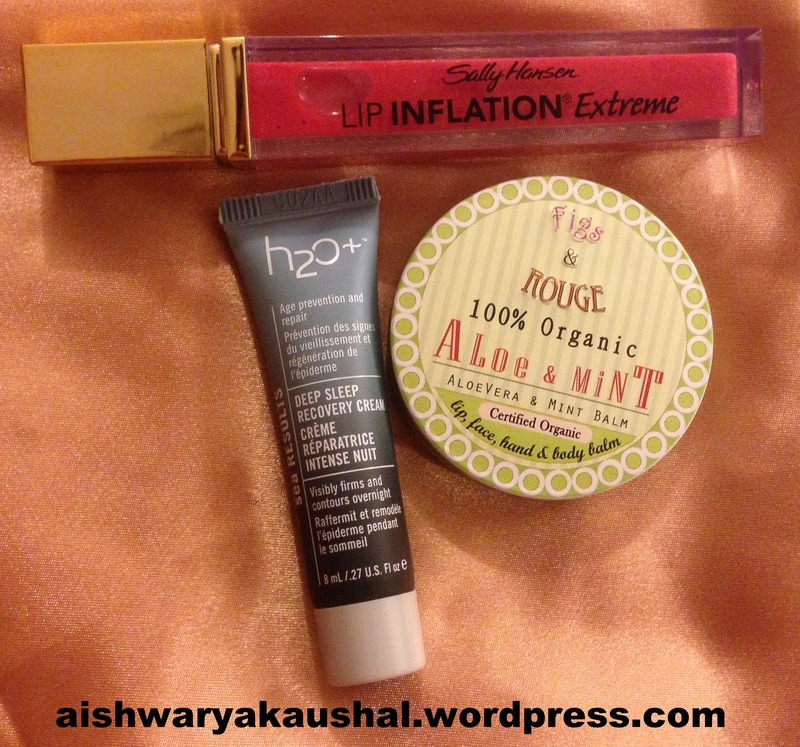 I do like the gloss and the balm but that tiny sample of night cream didn’t do anything for me! I’m hoping Vellvette steps up its game next month! Ditto…I was little disappointed by the over the top theme and dull delivery. I too got the anti ageing ampule and it was such a put off considering H2O was their spotlight product. And the sally hansen thing is waste! I will publish my review soon. The balm is not for lips, I am using it for my toe and hands.